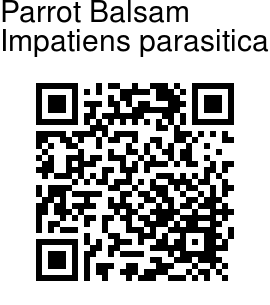 Parrot Balsam is a fascinating, rare species from Western Ghats. It is one of the only fully epiphytic balsam, typically found growing on moist tree trunks. 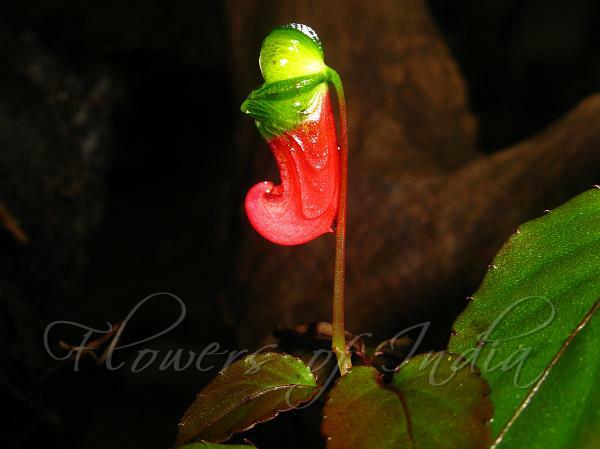 Its bizarre flowers resemble little tropical parrots, with their lime green hood and bright red, curled "tail". They appear in large numbers almost throughout the year. Stems are fleshy with prominent leafscars, wrinkled. Leaves are clustered at the tips, up to 4 x 2.5 cm, ovate saw-toothed, pointed at tip, rounded at the bas, leaf-stalk up to 2 cm. Flowers are borne in 2-4-flowered clusters in leaf axils. Flowers are 2 cm long, scarlet, spur channelled, broad, blunt. Sepals are green, pointed, wings 2-lobed, lower lobe larger, flat, enter into the spur of the lip, red, standard green. Flowering: June-November.